I fly quite a bit — so much that I’ve been either Premiere 1K or Platinum on United for the past several years. 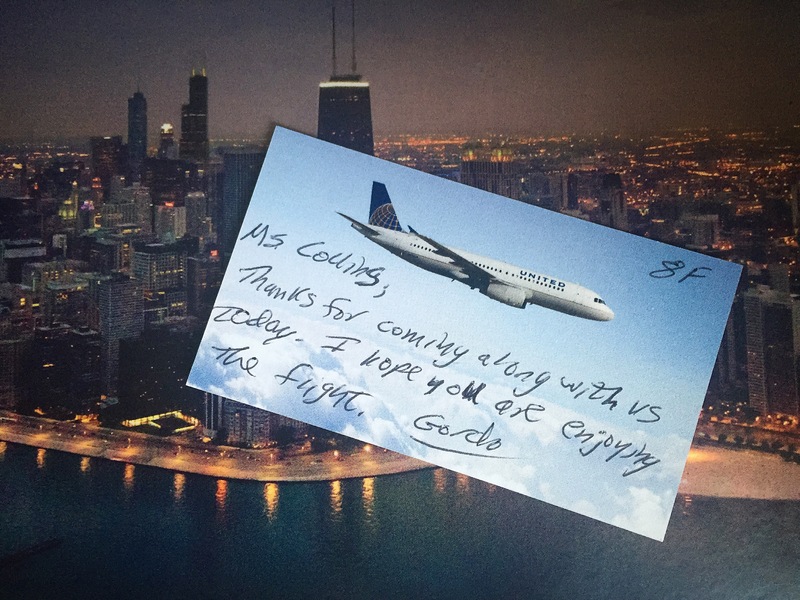 Despite my hundreds of flights and dozens of upgrades, it was not until last week that I had my most epic customer experience with the airline (and yes, I was in coach). Enter Captain Gordo McQueen of UA685. Thx for kicking off our morning with your audience address. You taking the mic to say hello + inform those at Gate 66 what we could expect from today’s flight was a new one for me (and I’m sure the majority of flyers). Your mentions of the beautiful trip up the coast and the array of sights that we’d see made the short flight sound almost delightful. As I looked around the gate while you spoke, I saw a mix of amazed shock + large smiles from those listening. Then when you finished, those people looked to their neighbors and flashed another smile. The few minutes you spent with those waiting to board your flight set a friendly tone + went above and beyond what people expect from today’s airlines. I’ve attended various relaxation and meditation classes, but nothing’s ever quite spoken to me like this meditation gem. Priceless. Thank you Jeff Lewis of Flipping Out for turning me on to the comedic (yet relaxing) goodness that is F*ck That: An Honest Meditation by Jason Headley. Purchase on iTunes, download the app (for even more goodness), or buy the book (a great gift). As I attempt to get on a more regular schedule with blogging, I decided that I’m going to start sharing some of my favorite tunes both new and old. Focusing on artists or songs that might be a bit more under the radar, but warrant to be so much more. For the older ones, it’s also a prompt for me to revisit some of my standbys and get them back into circulation. I first heard this song when Chicago’s own Brighton, MA opened for Elvis Perkins in Dearland (another gem) in late 2007 at the Lakeshore Theater. I’d previously known a couple members of the band from Scotland Yard Gospel Choir, but this was the first time I’d heard this new project. They played a few songs that night (including ‘Graceland 02’ which is another favorite), but something about ‘Good Kind of Crazy’ was just right. Not only did the words speak to me, but that drum…. that drum is mesmerizing. Starting with small brushes and then into a solo set with such passion — around 3:20 in the video (4:03 in the recorded song) the beats explode and pull you in from every angle. The lyrics drew me in and the drums hooked me. Find it on Spotify + iTunes. A couple months back, I turned 36 (seriously? where have the years gone?). Just after my birthday, I wrote up this list and published it to the List App which I’ve been testing out. Since I intend for this blog to be my content hub going into the future, I thought I’d repost it over here. A nice little tribute to birthdays past — going from childhood to a full-fledged adult in PJs on her birthday. A look back at some memorable (+ not so memorable) birthdays from yesteryears. I had a slumber party — I got to invite 5 friends. One friend got me a pack of sparklers + a Kirk Cameron poster (she was a big fan). There was drama in the middle of the night where half the girls slept in one room and talked about the girls sleeping in the other room. My 23 year old friend + neighbor took me to get my license. I drove my Mom’s red Chrysler Lebaron convertible for my driving test. That night my sister (14) and I went to the mall + cruised the streets of my hometown (Peoria, IL) while listening to DMB’s ‘Crash’ album. I was interning at WFAA in Dallas on their morning show ‘Good Morning Texas’. After work, I went outlet mall shopping + drank giant frozen strawberry margaritas w/ my aunt. Two days later, a guy (no hablo ingles) ran a red light and slammed into my car (no hay margaritas implicados). I had a rental (a grey Saturn) for the rest of the summer. My first birthday after my move to Australia. I (reluctantly) said goodbye to the twenties + having a summer birthday (damn Southern Hemisphere living). Took a chilly trip to the Barossa Valley for a fun day of wine drinking + an evening at an old hotel w/ my boyfriend (now husband) and friends. The heat went out in our hotel and I slept in my coat. My husband (whose bday is a few days before) and I planned a dinner for 12 friends + then hit the bars of Adelaide after. At 1am my husband fell asleep while sitting at the bar. I continued on without him — playing slots at the casino then wrapped the night with McDonald’s in bed at 3am. I spent the first half the day flying from LAX to ADL + the second half of the day napping. We had a fire in the fireplace, ordered pizza, and watched The Americans. I was asleep by 9pm. Wild times at 36. It’s a good month to be Mavis Staples. She has an HBO Documentary ‘Mavis!’ airing February 29th – and tomorrow she’ll have a new album out titled ‘Livin’ on a High Note’ which was produced by the great M.Ward w/ songs written for her by other greats such as Nick Cave, Neko Case, Justin Vernon, and more. Watch the trailer + get the tunes. I love myself some of Mavis Staples’ gospel. She’s a true American icon and at 76 years old… damn, that woman can still sing it. While we wait for tomorrow’s release… here are two versions of one of my MS favorites — ‘The Weight’ which The Staple Singers performed with The Band at ‘The Last Waltz’ concert turned (classic) Scorsese documentary. First up — from my sweet home Chicago… Wilco, Nick Lowe, and MS in rehearsal at a December 2011 concert. And… the classic. The Staple Singers performing with The Band at their legendary ‘The Last Waltz’ concert in November 1976. Last night I asked my husband if he knew of Nicholas Sparks. He replied with “no”. After confessing my love for ‘A Walk to Remember’ + ‘The Notebook’ (no brainer) and reminding him that he sat through a TV viewing of ‘Dear John’ (while I was sleeping) a few weeks back — I shared with him that Nicholas Sparks is a book author and that he’s basically the Stephen King of chick flicks. I said that if he Googled “the Stephen King of chick flicks” he’d be sure to find Nicholas Sparks’ name in the top results. While I pride myself on being a master in the art of Google search terms, I have to admit that I did not bring my A-game this time. Even after going 10 pages into Google — still no sign of the “the Stephen King of chick flicks”. According to Wikipedia, there are 65 films based on the works of Stephen King. My favorites include: ‘The Shawshank Redemption’, ‘Stand by Me’, and ‘The Shining’ — but there are so many classics (not all starting with an S). Nicholas Sparks is trailing behind with 12 books being made into films. I’d still say that the guy is really making a go for it. He’s only been in the film game since 1999. Observation: the producers of these films really like the side angle/embrace the face pose on their promos/cover art — 7 out of 12. Anyway, because it seems that no one online has ever said “the Stephen King of chick flicks” (yes, there I go again) when speaking about Nicholas Sparks, I’m officially making the exclamation here (+ testing out my SEO skills at the same time). WordPress: 25% of the web + counting! When I started at Automattic in February 2012, 16% of the internet was powered by WordPress. Fast forward to this week, according to W3Techs most recent report — WordPress now has a whopping 25% market share! To put it simply, 1 out of every 4 websites have chosen WordPress to power/manage their site (based on data collected from the top 10 million websites). Yep, WordPress isn’t just blogs — it’s a quarter of the web + the world’s biggest content management system by “heaps” (as the Aussies would say)! Matt recently wrote about this accomplishment on his blog. If you are interested in learning more, I recommend the read. It goes into a bit more detail on the growth + the opportunities that lie ahead. Sending out huge congrats to everyone that contributed to this milestone — the thousands of people with the same goal of making the web a better place!